This is first time this album has been available in CD form. 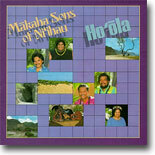 The original release of this album in 1986 marked the 10th anniversary of the Makaha Sons of Ni'ihau and was their eighth album. The Hawai'i Academy of Recording Arts awarded "Ho'ola" the prestigious Album of the Year and Best Traditional Album of the Year at the Na Hoku Hanohano Awards of 1987. It also won for them the Group of the Year award. The Makaha Sons of Ni'ihau began in 1976 in Makaha, on the leeward side of O'ahu. The original group included members Skippy and Israel Kamakawiwo`ole , Louis Kuakahi, Jerome Koko and Sam Gray. Now, twenty years later with many changes in their group, they continue to enthrall audiences everywhere. On this album they include some new songs and some new arrangements of some old songs. You will hear still another dimension of the Makaha Sons of Ni'ihau as they back their cousin Jean Ileialoha Keala Beniamina on two new songs. And they have included a non Hawaiian tune, "Wasted on the Way", a Crosby, Stills, Nash standard that has been part of their live performances for years and a song that has special meaning for them. They have a special quality to their voices and a very Hawaiian way in which they present their music - whether it is in Hawaiian or in English. With their unique sound and rich harmonies, the group is continuing the traditions of Hawaiian music. A definite collector item.